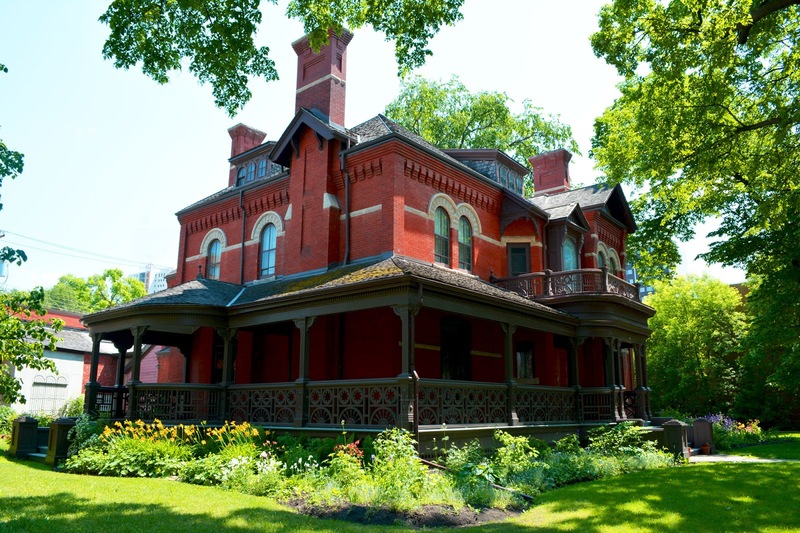 Originally home to John Inkster, previously site of the Battle of Seven Oaks, and currently home to the Seven Oaks Museum at 50 Mac Street, this house was built from 1851 - 1853 and is one of the earliest surviving examples of its kind. Inkster seems to have spared no expense and splashed out on imported glass windows for his new home. Coming from the barren Orkney Islands in Scotland, Inkster represents one of the earliest waves of immigrants to Manitoba. The house itself is a simplified Georgian style, with largely functional features that are nevertheless pleasing. Inkster took good precautions against the chilling Manitoba winters by insulating the main floor walls with buffalo hair, fur, and plaster. See the previous blog post on Seven Oaks House here. 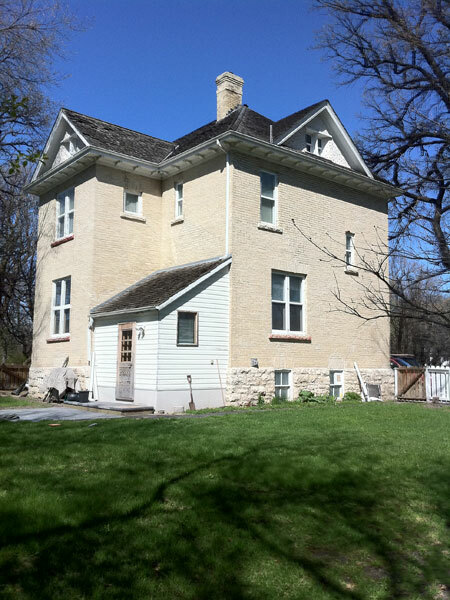 William Brown House is one of the last surviving examples of the Red River house style - a once-ubiquitous home design for the earliest settlers. 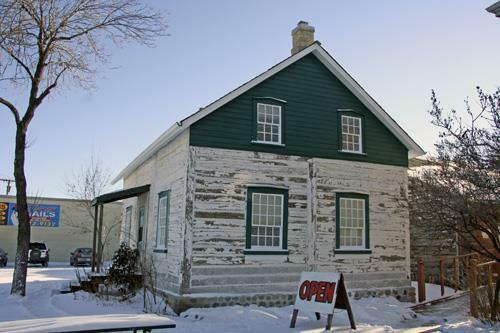 The house was originally built west of Winnipeg, on one of the Assiniboine River farm lots sold to early immigrants who wanted to farm the land. These lots were sold by the Hudson's Bay Company, which employed William Brown as a cook and a labourer. At this time, the province of Manitoba did not yet exist, and neither did Winnipeg - it was part of a vast parcel of land owned by the Hudson's Bay Company. Rupert's Land, as it was known, stretched from Quebec, across Ontario, enveloped Manitoba, and Nunavut. The house itself has been built in the typical Red River frame style, with hand-hewn oak logs and simple side-gable roof. 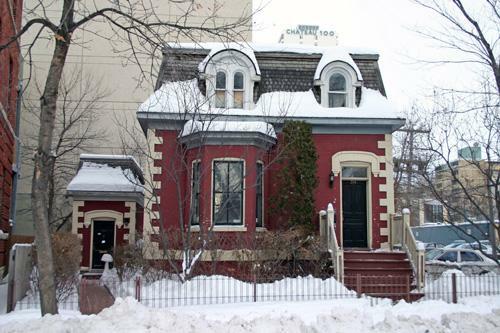 Other Red River frame houses in Winnipeg include Barber House at 99 Euclid Avenue, built in 1862, and Ross House on 140 Meade Street North, built in 1854. 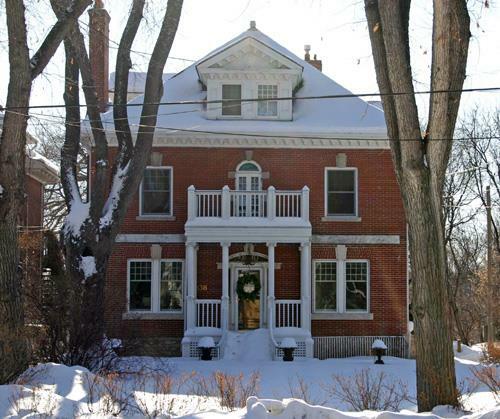 Kittson House, or Maison Kittson at 165 La Verendrye Street, is one of the earliest houses in the St. Boniface neighbourhood. To set the stage, Manitoba had been made a province only 8 years earlier, after the Red River Resistance of Louis Riel. As of the year 1872, the population was 1000 or thereabouts, but by 1880 it would be up to 8000. Maison Kittson is a slightly more elaborate riff on the frame house, with a wraparound verandah and cross-gable roof with a balcony on the second level. Located at 121 Kate Street, this house was built for William Ashdown, brother of business magnate James Ashdown, and is an early example of a subdued Queen Anne Revival style (very popular in the 1890s, as we will see). Typical Queen Anne Revival features include asymmetrical facades, complex rooflines, unusual windows, and the odd turret or two. Ashdown House itself exemplifies a few of these characteristics: although the front facade is not symmetrical, it looks balanced, and the bay window under the front gable doesn't match any of the other windows. Built in brick, the exterior of the house matches the interior, which is also elegantly understated. Unlike the earlier houses, for which features were largely functional, decoration appears in both the exterior and interior features of W.M. Ashdown House. This house should not be confused with James H. Ashdown's house, now housing the historic restaurant 529 Wellington (blog post here!). In 1883, Winnipeg was booming. The railway had finally connected in 1882, and new settlers were pouring into the city. However, this influx was tempered by a number of Manitoba's prominent Metis families that had moved out to small communities (like St. Norbert) in order to preserve their culture and traditions after the Red River Resistance of 1869-70. McDougall House is a contrast to the houses of early elites like the Ashdowns: horizontal wood siding covers rough-planed logs laid with dovetail joints, simple rectangular windows, and a wood-shingled gable roof. This is the kind of house that many settlers would have built upon moving to Winnipeg. The house was originally built near Lorette, along the Seine River and was later moved to St. Norbert Provincial Heritage Park. Map of Winnipeg, 1884. This map shows some of the prominent buildings that defined the Winnipeg cityscape. Kerr House was built at 453 Qu'Appelle Avenue for the educator Francis Ferguson Kerr, principal of Carlton School from 1886 - 1893. 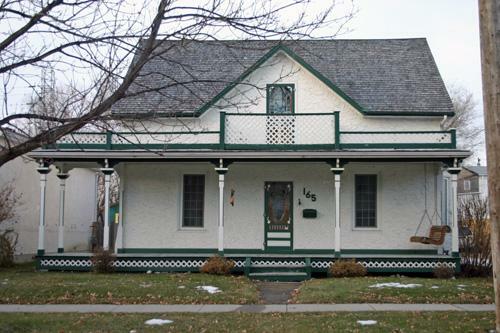 This house is a rare example of Second Empire style architecture - rare in the Prairies since development occurred after the style fell out of use in other areas. Typical features of the Second Empire style, named after the Second Empire period in France, include the characteristic Mansard roof, which maximizes attic space, as well as elaborately styled windows and dormers (roofed structure above the window increasing space). Second Empire style was used to create a sense of worldliness and sophistication by drawing on its association with France. Although this style is practical in the sense that it creates more space, it soon fell out of use due to its susceptibility to fires, which at the time people thought began in the spacious mansard roofs. 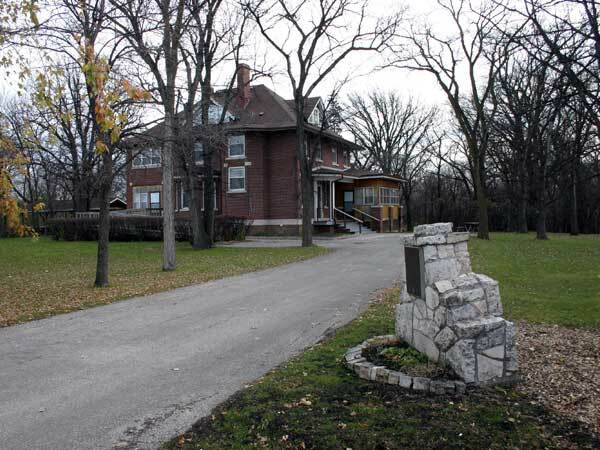 Today the house is located at 351 Assiniboine Avenue. Penrose House at 444 Logan Avenue, although built for James McDiarmid, gets its name from a James Penrose. Penrose was an early photographer whose family lived at Penrose House from 1905 to 1925. This house is an example of Queen Anne Revival style being used in working-class buildings, and would have been very common across North America at the time. In the mid 1890s, Winnipeg was growing rapidly. The Wheat Boom was in full swing and Manitoba wheat accounted for over 40% of the national wheat harvest. The mass immigration to Winnipeg was rapidly changing the demographics of the population - whereas in 1870 about half of the population was Francophone, by 1891 that statistic had plummeted to 7.3%. 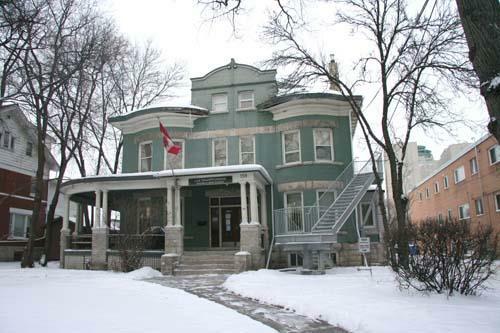 Dalnavert House at 61 Carlton Street in Winnipeg was the home of Sir Hugh John Macdonald, the son of first Prime Minister Sir John A. Macdonald, and Premier of Manitoba from 1899 to 1900. This beautiful house-turned-museum is another example of Queen Anne Revival style, although a little more ornate that either Penrose House or Ashdown House, accomplished by the dark red brick with light accents, wrap around verandah, gingerbread trim and multiple chimneys (asymmetrical, in typical Queen Anne Revival style). 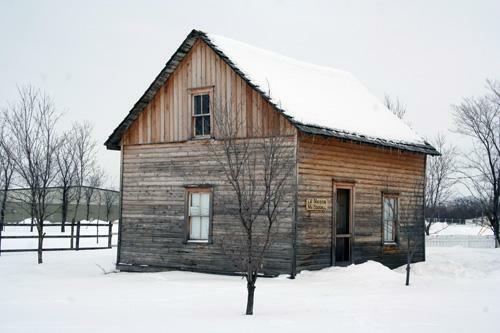 An immigrant from Montreal, C. George Caron built this house at 50 Cass Street in 1901 after farming the land around it for almost 20 years, the same year he was made Reeve of what was then the rural municipality of Assiniboia. Caron House is typical for a prosperous farm in the area in the early 20th century, and includes two balconies and a complex roofline. The exterior is done in light coloured brick with a wood frame, and many windows around the house ensure generous natural lighting on the interior. 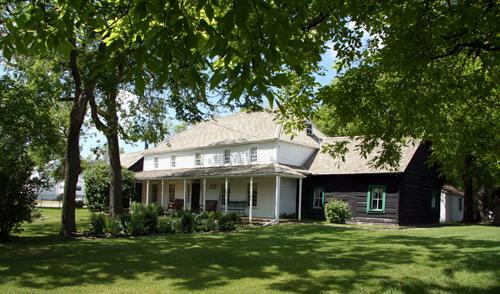 Caron House is surrounded by the original farm that the Caron family worked for over 50 years, designated as a park in the 1980s and restored to its original splendour by the Charleswood Historical Society. 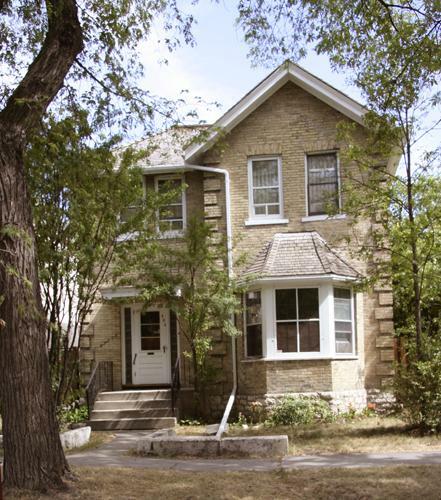 John Duncan McArthur's house at 159 Mayfair Avenue was one of the first built on the other side of the Assiniboine River from downtown Winnipeg. In 1881 the first Main Street Bridge had been built, and was followed in 1882 by the Osborne Street bridge and in 1894 by the first steel truss Maryland Bridge. The city was trying to accommodate its own growth by opening up the area of Fort Rouge for construction. MacArthur and his wife were the first owners of the house, and the more ornate Queen Anne Revival style reflected MacArthur's position as one of the most successful railroad contractors in Canada's West. The wraparound balcony adds comfort, while this particular example is more symmetrical than previous houses constructed in this style. The colour, however, is very typical of the style's more flexible design. This particular example is our last Queen Anne Revival building, the style falling out of fashion in the early 20th century, around the time of the Great War. McBeth House, although being built in the early 20th century, was built on one of the original lots sold to settlers in the early 19th century - in this case being one Alexander McBeth, in the late 1810s. McBeth house replaced an earlier log house constructed in 1852, and was built by Alexander's grandson Robert McBeth Jr. Queen Anne Revival having fallen out of style, McBeth house instead shows elements of Edwardian architecture, which is characterized by the use of lighter-coloured materials, less ornamentation, and simpler patterns, when compared to earlier Victorian styles. It is located at 31 McBeth Street, the street being named after Alexander McBeth. Looking at Moyse House at 838 Wolseley Avenue, there is a distinct shift in architectural styles - Moyse House is immediately symmetrical, with a characteristic Palladian window on its west facade. Originally built for business owner John Moyse, it was sold ten years later to grain merchant Wilfrid Campbell, then again in 1928 to George Cameron. By the time that Moyse House was being built, the most recent census had put Manitoba's population at a staggering 225,000 people. Compare Moyse House to the earlier Ashdown House - both built for families that were successful business owners, the size, ornamentation, decoration, and grandeur of housing changed significantly in those intervening 30 years. 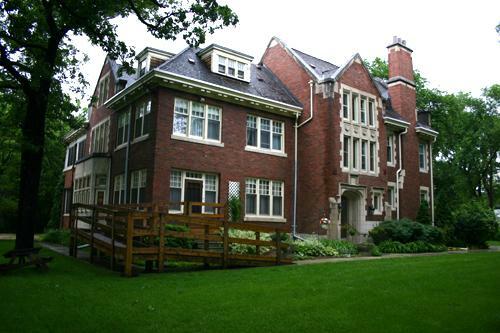 Ralph Connor House, named for the authorial pseudonym of Presbyterian minister Charles William Gordon, was built in the Jacobethan Revival style. Gordon himself wrote a series of moralistic children's novels that are noted for their portrayal of life in early Western Canada. The house, designed by G.W. Northwood, is a mix of Elizabethan and Jacobean architectural features. Particularly of note are the large multipane windows, with decorative limestone surrounds, and not one but three bay windows. The house is located at 54 West Gate in the Armstrong's Point neighbourhood. As you can see, housing in Winnipeg and surrounding areas of Manitoba has changed significantly over the years, from the simple but sturdy Red River frame house, to the whimsical Queen Anne revival buildings, to the stately and open homes of Winnipeg's elites in the early 20th century. In this time, Winnipeg had grown from a settlement on the Red River in 1812, to what people would call the "Gateway to the West". 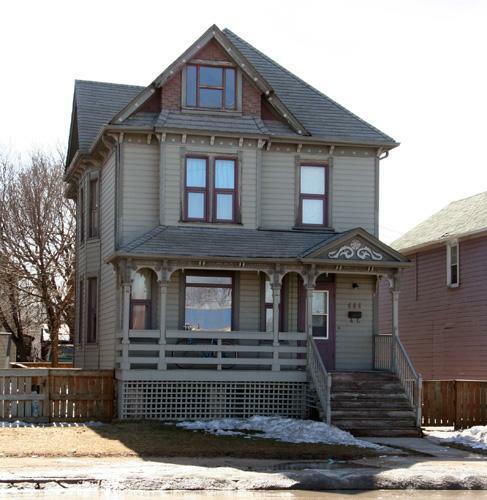 What's your favourite old house in Winnipeg? Have you had a chance to visit any of these historic homes?